Before I headed up to Canada a few weeks ago, I did a quick search to find out what typified Canadian cuisine. 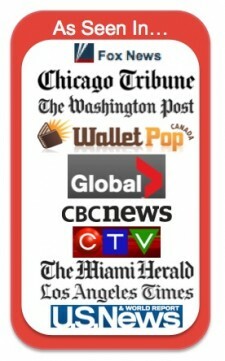 Almost immediately, I found lots of references to ¨Poutine.¨ I wasn’t even sure how to pronounce it. Was it poh-tyn, poo-tyn, poh-tyn-ee??? Turns out, I was completely wrong. It’s pronounced, poo-teen. Hmmm. Didn’t sound very appetizing. But, I figured, it’s potatoes and gravy. Has to be good right? The wild card would be the cheese curds. Wasn’t sure I was going to like that little combo. Surely, the TV crew would give us a good, hidden suggestion. They told us to go walk along the River Valley Path. That sounded good. And, we had driven past it earlier and it did look beautiful. But, the weather wasn’t going to let it. It got cold, windy was threatening to rain. So, West Edmonton Mall here we come! After a lunchtime interview with CTV, we headed to the mall and wound up eventually at the food court. The poutinerie (yes, that’s what it was called), caught my eye. I figured, now was the time to give it whirl. Tim, my colleague and friend from Gap Adventures, ordered the ¨Classic Poutine¨: fries, cheese curd and brown gravy. 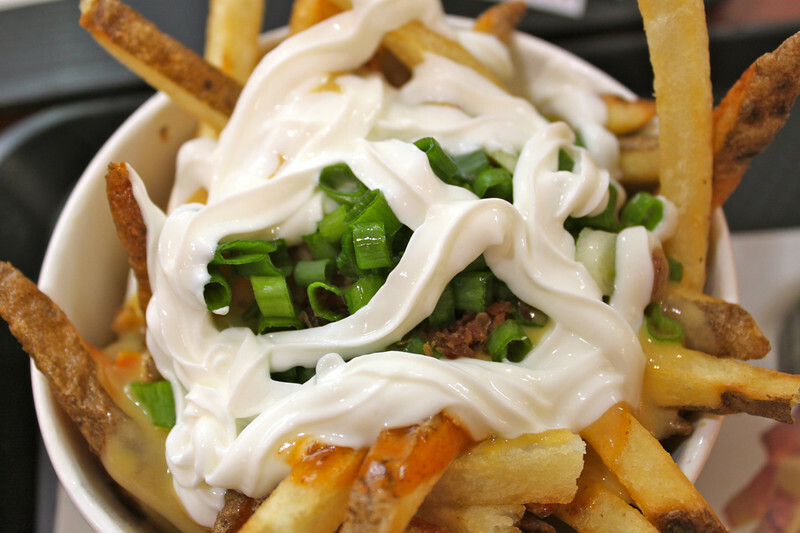 I went with ¨The Works¨: fries, sour cream, cheese sauce, green onions and bacon. Don’t worry kids, the menu at New York Fries is trans-fat free! It’s practically health food. While eating my poutine, and having a taste of Tim’s, it struck me that poutine is nothing more than Canadian nachos. It just has a name that sounds (to the foreigner at least) more high-brow. 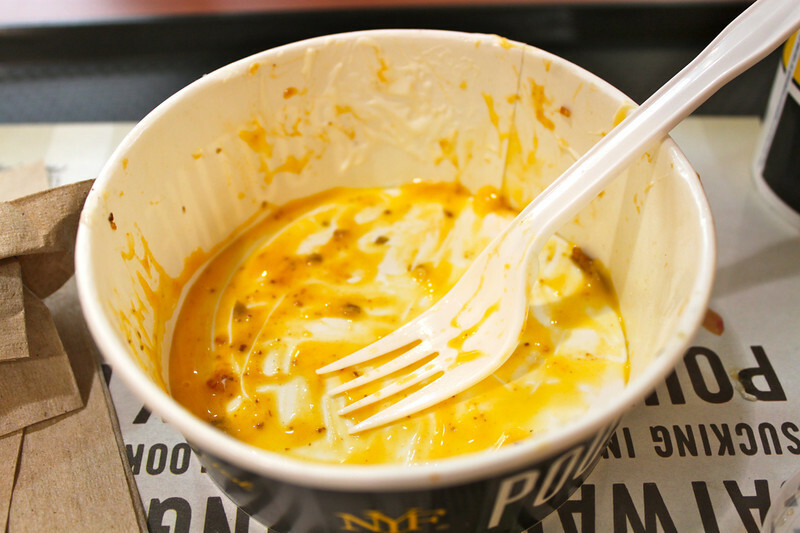 Once I made the connection between poutine and nachos, my next question was: Why has this not taken off in the US…especially when the fast food place where we ate is called New York Fries??? This entry was posted on Monday, September 26th, 2011 at 7:00 am	and is filed under Canada, Home Page Show Updates, Jeff's blog, Life on the Road, Where to go. You can follow any responses to this entry through the RSS 2.0 feed.You can leave a response, or trackback from your own site. I was living in Montana, nearest Poutine supply was 6 hours away in Lethbridge, Alberta @ The Red Dog Diner – well worth the trip! Never had it but dying to try it! I could eat nachos every day, so I’m guessing poutine will be just the same. Great post! @Maria, you are a die-hard fan. @Angie, you have to try it! Of course, not really too hard to make at home. That looks soooo yummy! 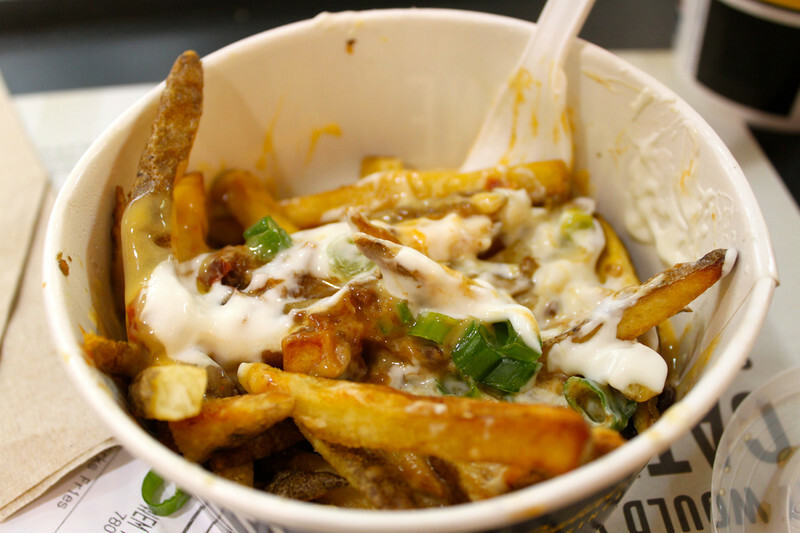 I would like to have a poutine right at this moment! Canadian’s get their nachos done right! mmmm…. poutine….!!! I had pleasant experiences with Poutine in Quebec. Those are just so good!! This would be good if it didn’t have the gravy on it. Thanks for all the comments guys. @Stephanie, that’s why I got the works. But, honestly, the original was pretty tasty too. It’s a shame though that Canada has decided it was a national dish, as it was invented in Quebec and still remains a very Quebec-ish dish. But that might be the nationalist fiber talking, haha! Not comparable in the sense that nachos are available pretty much everywhere in the US (even 7-11, gas stations etc…). 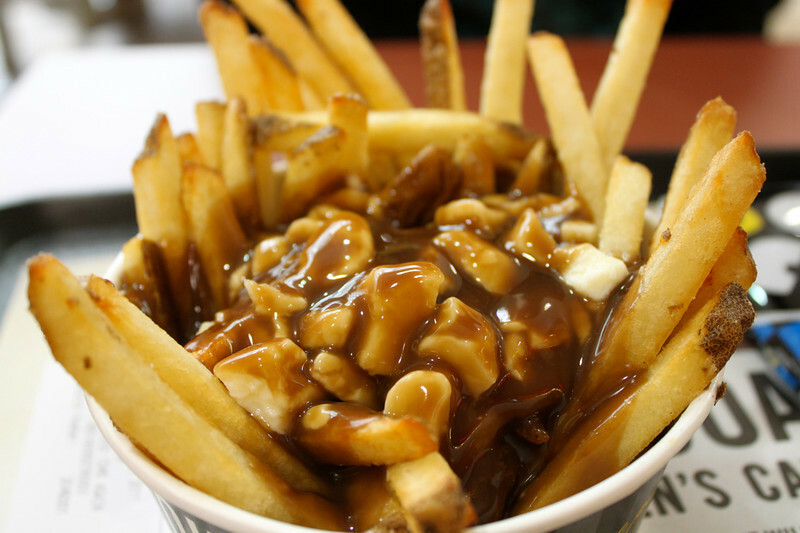 Poutine is a regional dish that is common in Quebec, but much less so everywhere else in Canada. In fact, outside of major cities, it is hard to find it except at the food court mall chains (which is no more authentic than nachos at TacoBell). As someone born and raised in western Canada, I find it amusing to hear people refer to it as a Canadian Dish. I was in my late teens visiting Montreal before I ever heard of it. I live in a community of about 100K currently and I’m betting there isn’t a plate of poutine to be found within 50kms (and then only in a food court or chain). If you want authentic poutine, you have to go to a Quebec Mum and Pop greasy spoon, not New York Fries at W. Ed. Mall. Sadly, Canada is too big and diverse a country to have a national dish, only regional favourites. Jake, thanks for the comment and perspective. 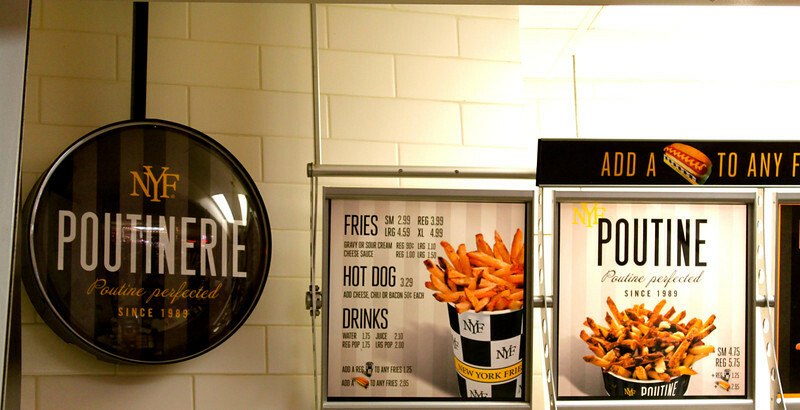 No doubt that New York Fries isn’t the real deal. Just happened to be where I first ate it. I will be sure to try the authentic poutine on my next trip back…in Quebec. mmmm… poutine! We tried poutine for the first time in Quebec City. Initially, we thought it was a fancier signature Canadian dish, until we realized it was kind of after-the-bar food, served at this fast food joint that apparently invented the stuff. Nonetheless, we thought it was really good. I had to laugh at the Poutinerie sign…. give me the works! While I’m back home in Canada for 2 weeks this winter I’m going to eat poutine literally 3 meals a day every day. Breakfast = Poutine with egg and bacon mixed in. Dinner = A more classy poutine, maybe with some veggies and strips of steak mixed in. I didn’t see any with a “the works” option when I was there…I feel like I was cheated because that looks delicious! You’re probably right Jamie. Of course, I didn’t get them from the most authentic place anyway! Next time, for sure! Kristen, I will not argue with you there. I’d go even further and say that anything eaten at a mall food court isn’t authentic anything. Next time, I’ll definitely go for the real thing. Thanks for the tip! I love them!! I can’t believe they don’t have them in the us! Somebody open up a canadian fast food chain!!! I’ve had these in the US, but here they’re called “Disco Fries”. It might just be an upstate New York thing though, I don’t know that I’ve had them anywhere else.